This class of large fast aircraft carrier was a development from the three ships of the pre-war Yorktown Class (see USS Enterprise ). 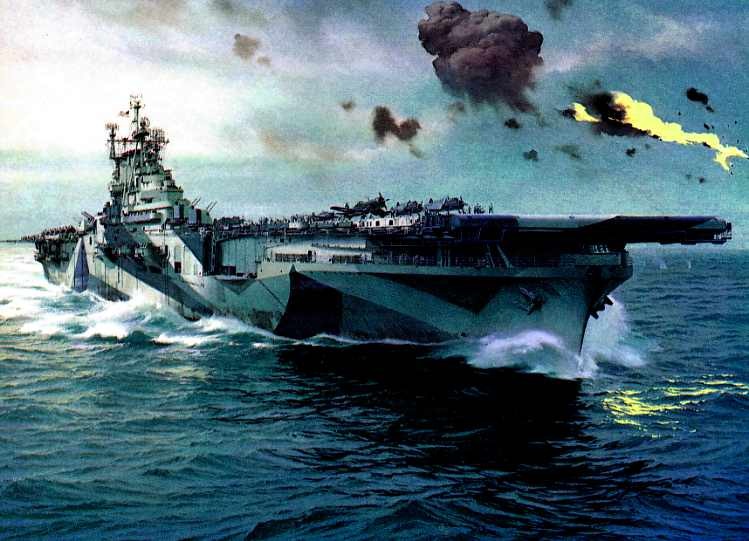 The Essex Class were the mainstay of the Fast Carrier Force, and by the end of 1943 constituted the main striking power of the Pacific Fleet. They were frequently subjected to extremely fierce air attack, especially from the Leyte campaign onwards. Many were damaged, some (especially Franklin) very severely, yet remarkably none were sunk. This testifies to the great courage and tenacity of US ships' companies - and to the effectiveness of the US Navy's damage-control techniques - as well as to the inherent strength of the Essex Class design. They were considerably larger than the Yorktowns but retained the same high speed, and they were given a very powerful and effective anti-aircraft armament (which was to prove itself essential, especially after the start of Kamikaze attacks on the US fleet in late 1944). They each had three elevators for their aircraft - the class introduced the deck-edge elevator. An astounding 32 ships of this class were planned and laid down. Although only 24 of these were completed this was still a remarkable figure, and no other class of large carrier has ever been built in comparable numbers. 17 Essexes were commissioned - 15 of these saw action - before the end of the Pacific war.